This build is meant for soloing, as in soloing ANYTHING. I love the Templar for it’s stamina regeneration, self-heals, and shield of destruction. The Harvester focuses on that trinity to keep resources up, dropping ultimate for health, and smashing enemies into dust. The more enemies you’re fighting, the stronger you become. You’ll be Carving enemies to generate massive ultimate then harvesting their dead corpses for stamina and health. This is an absolute blast to play and I feel powerful every time I logon. The character I’m using is Big-Jake, an Imperial race Templar. Usually when I’m making a build, I read every single class ability and morph and design around one or more class skills. In this case, it was Blazing Shield and Repentance. Blazing Shield holds a shield and does damage based on the amount of health you have, thus Imperial passives seemed a logical choice. Plus extra stamina with a two-hander and I feel this is a awesome race choice though a Redguard would have been great as well. Bar one is your primary bar you’ll be spending most of the time wielding. The general concept here is to leap in, getting your defensive shield up, and Carve their faces off. Once the shield pops and your done carving, swap to bar two for a Devouring Swarm (AKA bats) to finish off the enemies. Now Repentance to get health and stamina back then off to the next group. It’s really that simple. 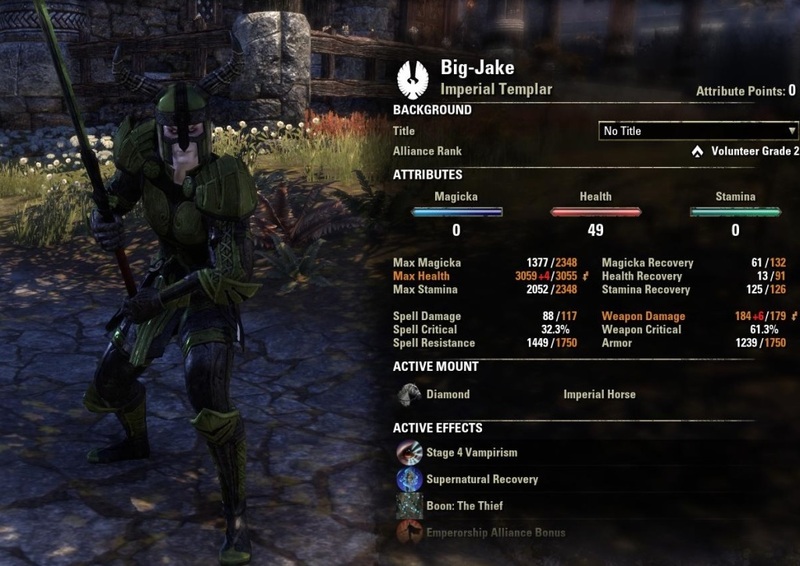 How do you get the nightblade skill “executioner” on a Templar build?